Landowners and farmers will soon begin thinking about setting 2019 cash rent levels with the current trade uncertainty as a backdrop to those rental negotiations. The possibility of trade disruptions has added uncertainty and negativity to the agricultural outlook. Moreover, recent price movements suggest lower returns in 2019 and continued downward pressure on cash rents. In this environment, re-evaluating long-run income potential from farmland seems warranted. In particular, taking losses on 2019 production in the hopes of higher returns in the future has become a riskier and more questionable strategy for farmers. Flexibility in setting 2019 rents is more of a priority than in recent years. Flexibility can be gained with a variable cash rental arraignment. Another alternative is to wait to set cash rents till later in 2018 or early in 2019 in the hopes that some trade and price uncertainty will diminish. Of course, the wait strategy could result in changed cash rents from those that would be currently negotiated. As has been well documented, prices for corn and soybeans have fallen since May (farmdoc daily, July 31, 2018), considerably diminishing income prospects for 2018 (farmdoc daily, July 10, 2018). Although not the only factor behind the price decline, trade disputes with China and NAFTA countries have contributed to this decline. Eventual resolution of those trading disputes is currently unknown. Besides impacting current year prices, the recent price declines also have impacted 2019 expectations of corn and soybean prices, which in turn will impact expected returns to farmland. 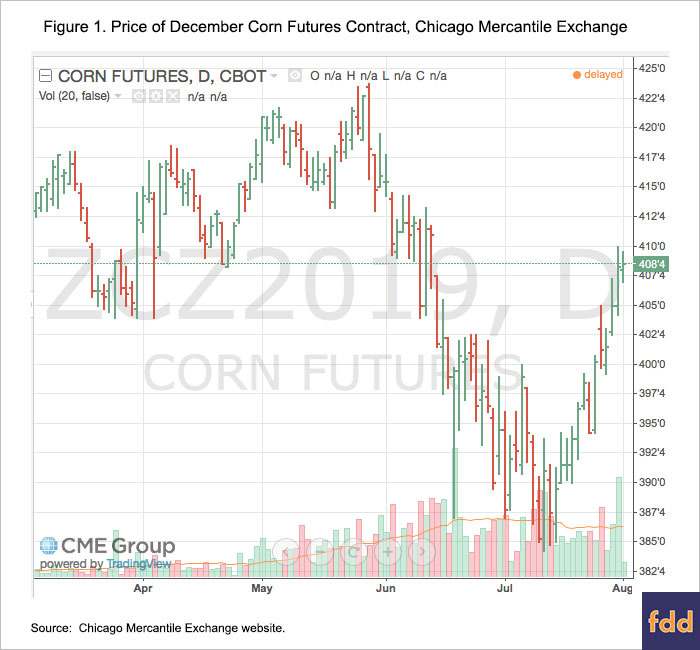 Good indicators of 2019 prices are Chicago Mercantile Exchange (CME) contracts that expire during the 2019 harvest. The December 2019 corn contract has declined from levels over $4.00 to levels near $3.80 in the middle of July (see Figure 1). Recently, prices have increased. The December 2019 corn contract is now trading near $4.00 per bushel. The futures price would need to be adjusted to a cash price using a futures-cash basis. A reasonable estimate for the central Illinois basis is -$0.20, resulting in an expected cash price of $3.80. Soybean prices have declined as well. 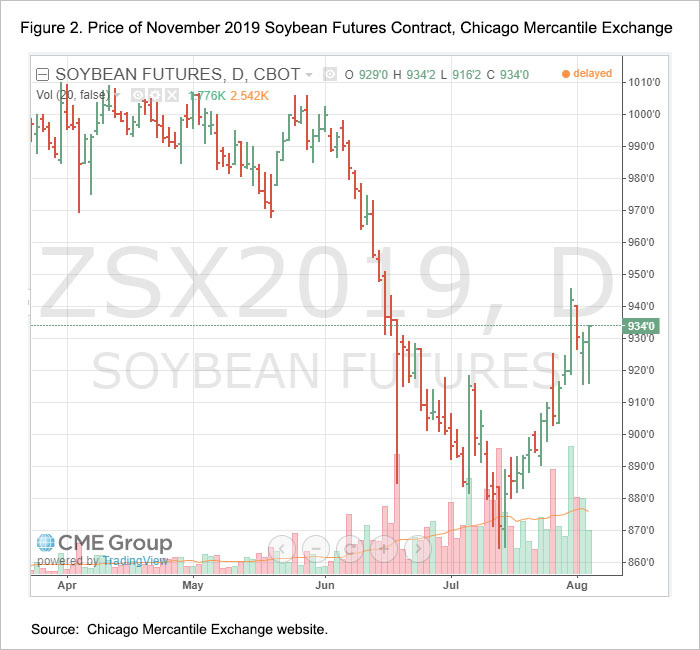 The November 2019 soybean contract was trading at levels near $10.00 for much of the first part of the year. Prices then fell below $9.00 going into July. The current level is near $9.30. Adjusting for a -$.30 basis, again a reasonable estimate for central Illinois, gives a cash price of $9.00 per bushel. At this point, using cash prices of $3.80 for corn and $9.00 for soybeans seems like a reasonable starting point for analyzing 2019 cash rents. Note that these price expectations will change and have considerable downside price risk. Trade disputes have had a history of having long lasting downward impacts on prices. Additional trade disruptions could cause further price declines. A corn price of $3.80 is slightly above actual prices in recent years. Farmers in central Illinois averaged $3.72 in 2014, $3.59 in 2016, and $3.40 in 2017. The corn price is supportive of higher corn returns than in recent years. The $9.00 planning price for soybeans is well below prices received in recent years. Central Illinois farmers averaged $10.67 in 2014, $9.39 in 2015, $9.99 in 2016, and $9.70 in 2017. A $9.00 price would have lower soybean returns. As structured in the 2014 Farm Bill, neither a $3.80 corn price or $9.00 soybean price would be expected to generate large payments for either commodity program: Agricultural Risk Coverage (ARC) and Price Loss Coverage (PLC). To illustrate, the reference prices for PLC in the alternatives are $3.70 for corn and $8.40 for soybeans. PLC would not generate payments at cash prices of $3.80 for corn and $9.00 for soybeans. The 2014 Farm Bill does not extend to 2019. As a result, either an extension of the 2014 Farm Bill or a new 2018 Farm Bill will need to be passed. The 2018 Farm Bill could modify commodity title programs resulting in payments for 2019. At this point, it does not seem prudent to budget a value for commodity title payments in 2019. As a result, the only expected revenue in 2019 budgets will come from crop revenue. It is likely that non-land production costs will increase. Energy prices have been increasing and non-land costs are correlated with energy prices (see farmdoc daily, June 5, 2018). Therefore, building in cost reduction does not seem prudent at this point in time. 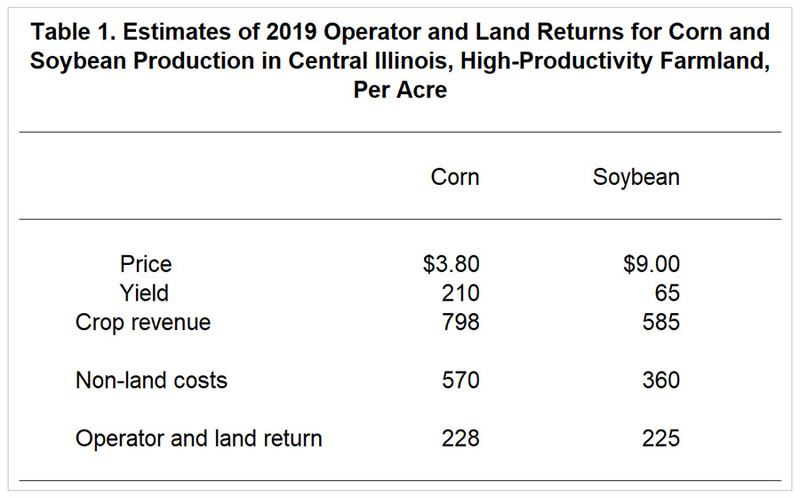 Table 1 shows estimates of 2019 operator and land return for high-productivity farmland in central Illinois. Yields are 210 bushels per acre for corn and 65 bushels per acre for soybeans. The only revenue in Table 1 is from crop sales and equals $798 per acre for corn and $585 per acre for soybeans. Non-land costs are $570 for corn and $360 for soybeans, slightly higher than 2018 projections. Operator and land returns are projected at $228 per acre for corn and $225 per acre for soybeans. This return is the amount that is left to split between the farmer and landowner. Cash rents for high-productivity farmland in central Illinois are averaging near $260 per acre. A $260 rent would generate a -$32 return for corn ($228 operator and land returns – $260 cash rent) and a -$35 returns for soybeans. Estimates of 2019 operator and land return point to negative returns to farmers given current rent levels. Negative returns on cash rented farmland has not been unusual in recent years. On average, farmers have had negative returns from cash rented farmland since 2014 (see farmdoc daily, August 22, 2017). Cash rents on high-productivity farmland in central Illinois have been slowing drifting down from a high of $293 per acre in 2014 to a projected level of $264 pear acre in 2018. Cash rents are “sticky.” Landowners do not want to see returns decline so are reluctant to lower cash rents. Farmers are reluctant to ask for lower cash rents because of competition for farmland and the fear of losing farmland. As a group, farmers appear to be pursuing a strategy of taking current losses on rented farmland in the hopes of higher returns in future years. In our opinion, current trade disruptions diminish the possibility of having higher returns in the future. Previous trade disputes such as the Russian grain embargo had long-run, negative impacts on prices (for a discussion see farmdoc daily July 13, 2018). This is likely to be the case with current trade disruptions. Even if trade disputes ended today, forces likely have been put into place that will result in expanded acres in South America and elsewhere. If trade disputes continue, prospects of expansion outside the U.S. grow, along with attendant long-term negative impacts on U.S. prices. As a result, the motive of taking losses currently in the hopes of future, higher returns from cash rented farmland becomes more questionable. Farmers may wish to reevaluate and lower cash rent levels for 2019 given a more pessimistic long-run outlook. Flexibility in setting 2019 cash rents seems more important than normal for those negotiating parties wishing to match cash rents to 2019 returns. Prices over a year in the future are always uncertain. Those price expectations are even more uncertain now given trade disruptions. Use of variable cash, instead of straight cash, rental arrangements are worth considering. Variable cash rents change the cash rent based on revenue outcomes ( see farmdoc, Variable Cash Rent Lease and farmdoc daily, September 27, 2011). Another strategy is to wait to set cash rents until later in 2018 or early in 2019. Some of the price uncertainty may be resolved by that point. Cash rents could be different. Schnitkey, G. "2018 Income Projections After Recent Price Declines." farmdoc daily (8):126, Department of Agricultural and Consumer Economics, University of Illinois at Urbana-Champaign, July 10, 2018. Schnitkey, G. "Historic Fertilizer, Seed, and Chemical Costs with 2019 Projections." farmdoc daily (8):102, Department of Agricultural and Consumer Economics, University of Illinois at Urbana-Champaign, June 5, 2018. Schnitkey, G. "Negative Cash Rent Farmland Returns Since 2014 Reduced Farmer Net Incomes." farmdoc daily (7):153, Department of Agricultural and Consumer Economics, University of Illinois at Urbana-Champaign, August 22, 2017. Schnitkey, G. "Cash Rent with Bonus Leasing Arrangement: Description and Example." farmdoc daily (1):160, Department of Agricultural and Consumer Economics, University of Illinois at Urbana-Champaign, September 27, 2011. Swanson, K., J. Coppess and G. Schnitkey. "Trade Timeline and Corn and Soybean Prices." farmdoc daily (8):141, Department of Agricultural and Consumer Economics, University of Illinois at Urbana-Champaign, July 31, 2018. Zulauf, C., J. Coppess, N. Paulson and G. Schnitkey. "U.S. Corn, Soybean, Wheat Exports and USSR Grain Embargo: Contemporary Implications." farmdoc daily (8):129, Department of Agricultural and Consumer Economics, University of Illinois at Urbana-Champaign, July 13, 2018.